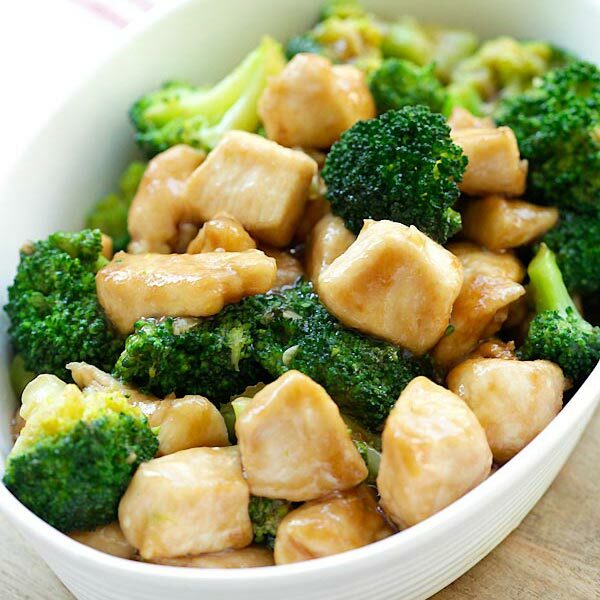 Chicken and Broccoli - Learn how to make the best and most popular Chinese chicken and broccoli stir-fried in a brown sauce the healthy, homemade way! 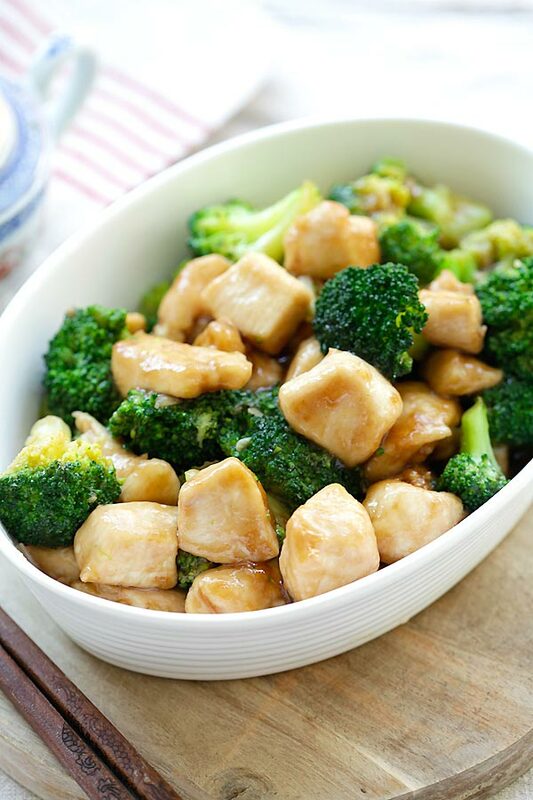 I have a bunch of amazing Chinese recipes to share with you, starting with a family favorite, chicken and broccoli. 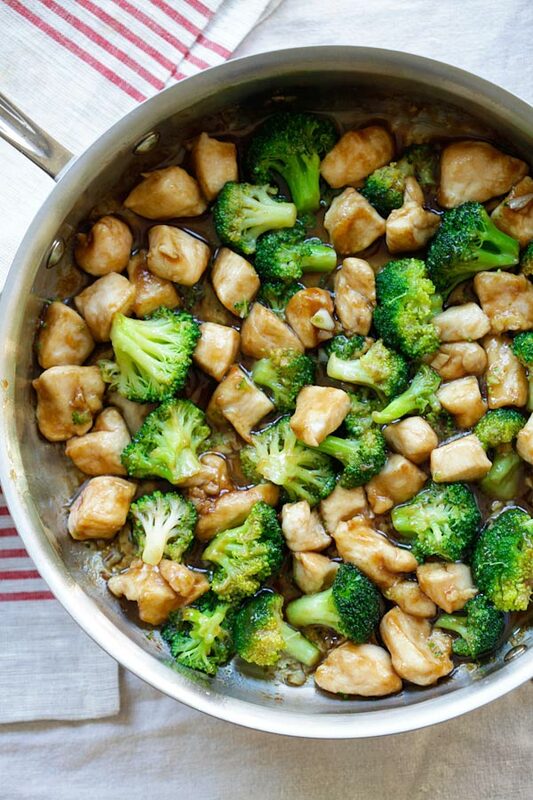 This Chicken and Broccoli recipe is one of my child’s favorite Chinese chicken stir-fry dishes. He loves the tender chicken, and he has always loved broccoli, and the savory and yummy brown sauce completes the dish. A few years ago, I wrote a best-selling Chinese cookbook “Easy Chinese Recipes” and I talked about the techniques of making chicken tender that produces Chinese restaurant quality dishes. For more information on how to make chicken and broccoli as well as many other recipes, you can buy it on Amazon. 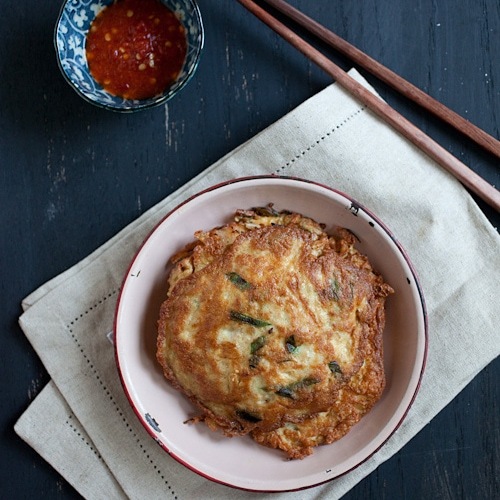 This super easy recipe tastes just like your favorite Chinese takeout joints, if not better. This homemade version is also less greasy and healthier! You can change the protein and make it into broccoli beef. This meal is best served with steamed rice. 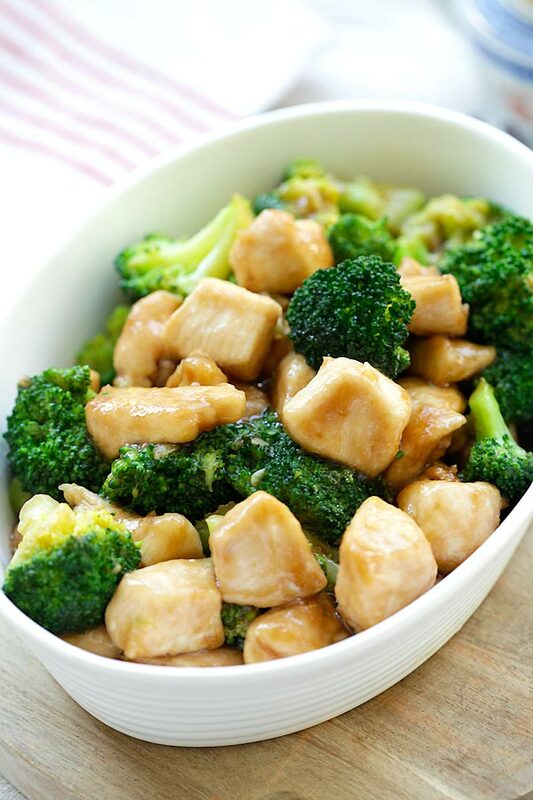 Chicken and Broccoli – Learn how to make healthy homemade chicken broccoli in brown sauce. 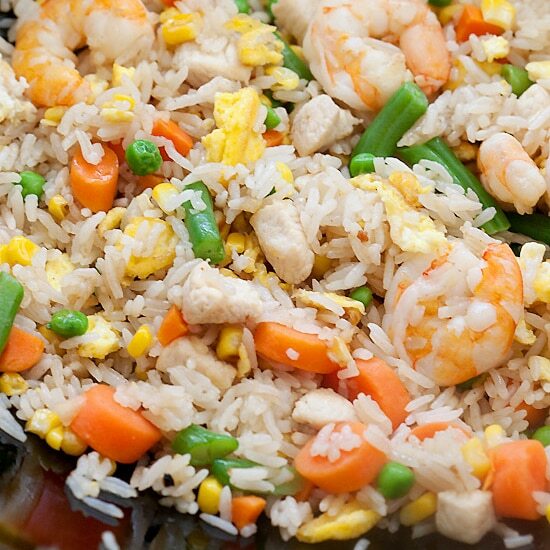 Best and popular Chinese takeout recipe! Marinate the chicken with the cornstarch and salt. If the chicken is too dry, add a little water so each piece of the chicken is nicely coated with the cornstarch. Heat up a pot of water and bring it to boil. Cook the broccoli for 1 minute. Drained and set aside. Heat up a wok or skillet on high heat, add the oil. When the oil is heated, add the garlic and stir-fry until aromatic or become light brown. Add the chicken and do a few quick stirs. Add the sauce and turn the heat to low. When the chicken is cooked through, add the broccoli, stir to combine well. Dish out and serve immediately. Don't overcook the broccoli. The broccoli should be crunchy and have a bite. I just wanted to let you know just in case you did not already know :) there are a couple of different soy sauces available to us. There is dark soy sauce that is mostly used for red meats…it “stains” the meat a dark color. There is also light soy sauce…not to be confused with light as in low sodium. Light soy sauce is friendly with meats such as chicken and fish where you do NOT want the meat to become darkened by the soy sauce. And then there is also light sodium soy sauce which has at least 30% less sodium for those on a restricted sodium diet. Frank – the recipe is at the bottom of the page. Please scroll all the way down for 5 seconds! Such a all time great recipe, full of flavor, joy to eat, quick to make. Love it. havent try before the combination of chicken and brocolli.. will try this once.. thanks for the recipe. Made a double batch of this for dinner tonight. Easy and delishious. Couldn’t believe the chicken came out so moist and tender. Yes, just like Chinese restaurant’s. I made this last night and it was fantastic! I had all of the ingredients on hand so it was super easy, incredibly delicious, and it was quick getting on the table! This is definitely going to be on regular rotation for our weeknight dinners! Yum! I am going to have to make this. I am slowly learning how to make Asian recipes and this look so easy! Great easy dinner. Thank you so much. I added a little red pepper to this as my hubby likes things spicy. Thanks again. Great idea, thanks for trying my chicken and broccoli recipe. Hi, what does lb of chicken breast mean? This was a simple and quick recipe. Unfortunately it was a bit bland. I liked it, but my taste runs to a more seasoned dish. I ignored my instincts and followed the recipe. I needed to season it after it was cooked. That said, it may be perfect for the family with “picky” eaters. Hi Ray, yes this chicken and broccoli recipe is very mild tasting. You can add more oyster sauce if you want a deeper flavor. superb.. i like the simpleness of ingredient in this recipe.it is easy to prepare even for noob cooker like me.. will try this. gonna love it. Could I work without the Oyster Sauce? Yes you can use soy sauce but it’s not going to be as flavorful. This was an easy kid-friendly dinner. I couldn’t find my oyster sauce and used hoisin sauce as a replacement –which also is more to my 8 yr. old’s tastebuds and gave it a subtle 5 spice flavor. Thanks for the great recipe. I know we’ll make this again soon. This dish is a bit bland. Also, the thickened sauce turned watery when I added the blanched/drained broccoli florets. Due to dietary concerns I use less sodium soy sauce but also added a teaspoon of molasses to give the sauce a darker color. On the plus side the chicken was very tender and the dish was not swimming in an MSG-laden syrup sauce like you get from the restaurants. I’ll try this again but with some modifications: Increase the cooking oil (peanut) from 2 TBS to 3, cook the chicken first (to give it a good searing in the hot oil) and then lower the heat a bit and add the garlic second. I’ll reduce the amount of water in the sauce from a 1/2 to 1/3 of a cup. Hello, I enjoy your recipes and have tried many of them. I just want to comment that your timings are misleading. You say that prep time is only 5 minutes but you are not including all of the prep. You left out washing and cutting the broccoli as well as cutting up the chicken, removing unwanted fat from the chicken. It would got good if you included more accurate prep times that truly capture the end to end time required. Conlivia – I buy skinless and boneless chicken breast and they have no fat. I just need to cut into cubes. For broccoli, I usually buy the broccoli florets in a bag and they are ready to be cooked. The prep time is very fast for me, but I am an experienced Chinese cook. I understand that for someone who has never tried the recipe before, it might take longer. Have just made it, and I LOVED it! The sauce is terrific! It’s so good I took sips of it on its own :) I can’t believe such yumminess can be so simple to make. I had to substitute oyster sauce for fish sauce, but hope to try it the original way next time. This recipe was outstanding! I followed it exactly, which I feel you should do when rating. Our family of 6 just loved it. I’ve tried other chicken/broccoli recipes, but this was by far the best. The chicken was incredibly tender. Thank you so much for sharing! Brocolli chicken is one of my favorite recipe, especially for my diet. Hi Rasa, this one looks awesome! I’ve featured it in my new post today and I hope it’s okay! Hi Leslie, sure, as long as you link back. may i use boneless skinless chicken thighs instead of boneless skinless chicken breasts? Thanks Wendie for trying my chicken and broccoli recipe. Superb – a lot less faff than the usual velveting techniques – thank you! I would have really appreciate a rough idea of how long the chicken would take to cook though. Hi Kate, thanks for your comment, the chicken cook really fast, in a minute or two. Hi, can I check if I can omit sugar in the sauce? Thanks. Oyster extract sauce. It’s not oysters. 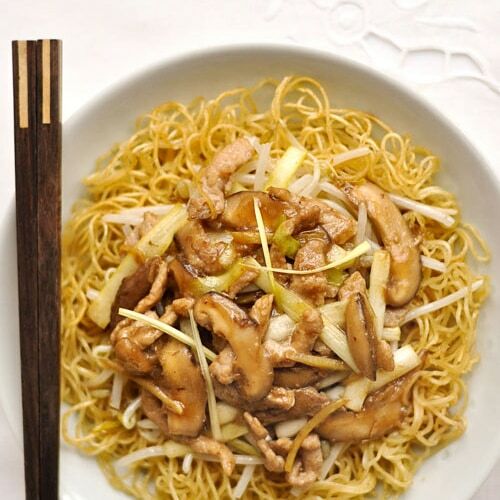 All Chinese food in the restaurants use oyster sauce, it’s a key ingredient in Chinese cooking. There is nothing yucky about it. It would got good if you included more accurate prep times that truly capture the end to end time required. I read some of the reviews about the recipe being bland so I was a bit worried I wouldn’t like it. However, not only did I love this recipe, my children raved about it as well. It’s delicious! I used low sodium soy sauce to control the sodium in my meal. I followed the directions exactly as they were posted and I wouldn’t change a thing! Perhaps those who like it spicier can add red pepper flakes? I give this 2 thumbs up and 5 stars! I will definitely make this again and check out the other recipes! Thanks for posting this! Hi Linda, thanks for your rave review. I am so happy that you liked my chicken and broccoli recipe. Loved this recipe. Will be added to my rotation! So easy and very yummy! Doubled recipe, but no other changes were made! Can you please make one with “white sauce”? This was so easy to make. So delicious and will be making this again soon!! Sounds amazing..cant wait to try? I just had this recipe now and it was so awesome. Even my family loved it. Next time I wanna try to add more veggies to it, carrots, beans and maybe mushrooms? I make chicken and broccoli using this recipe all the time! Soo good and easy to make. Whipped this up late last night- needed to cook something for my daughter to bring to school today! She had specifically requested for chicken and broccoli so I found this recipe. One word: YUMMY. Smelt so good i could almost taste it while cooking, so i ended up having supper at 11pm! ? I added cut up fish cakes as well (little boss’ request). Just delicious. Making it again tonight as there wasn’t enough to go around! Thank you for the beautiful recipe.